Chinatown is a district of San Fierro, San Andreas. It is home to a predominantly Asian population, and rests in the heart of the city, just west of Downtown. Chinatown lies north of King's, east of Santa Flora and Juniper Hill, and south of Calton Heights. 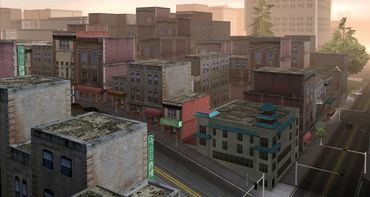 San Fierro's Chinatown is modeled after that of San Francisco, and even contains a replica of the decorated archway at the intersection of Bush Street and Grant Avenue that acts as an entrance to the neighborhood. Chinatown is Mountain Cloud Boys Triad turf, and is defended fiercely by its overtly polite members, who often shoot AK-47s at anyone engaging in criminal activity on the streets. Chinatown is also the San Fierro base for Wu Zi Mu (Woozie), the leader of the Mountain Cloud Boys. According to the game manual description of Chinatown, it has the largest amount of Chinese residents outside of China. After arriving in San Fierro, Carl Johnson realizes that his work in this new city is cut out for him. The garage he won in a race with Claude and Catalina is derelict, and in desperate need of repair. To add to this, Carl has just discovered that the entity responsible for the events that have led up to this point, the Loco Syndicate, is largely based in San Fierro, and that its leaders are close by. However, things start looking up when Carl receives some unexpected help from his new allies in San Fierro, The Truth, Dwaine, Jethro, and Zero. On top of this, a new ally appears, none other than the mysterious Wu Zi Mu, with whom Carl had raced earlier at Red County. Carl realizes this new contact is more than just a black-clad street racer: he is, in fact, the head of one of San Fierro's most powerful crime organizations, the Mountain Cloud Boys Triad, whose home base sits in the heart of Chinatown. After Woozie pays Carl a visit at his garage, Carl begins performing tasks for his new ally in an attempt to strengthen his forces against the Loco Syndicate. Woozie's gang is engaged in a war with its fiercest enemies, the Da Nang Boys, a Vietnamese crime organization that has just moved to the United States, choosing San Fierro as its base. Carl is employed by Woozie to help in the fight against the Da Nang Boys, first by wiping out a small attacking force attempting to breach Mountain Cloud Boys' territory in Chinatown, then by acting as a decoy while Ran Fa Li, the leader of Woozie's controlling organization, the Red Gecko Tong, makes his escape from would-be attackers. Finally, Carl is asked to plant a bug on the Da Nang Boys' container ship northeast of Pier 69, then later infiltrate a separate ship and rescue a set of prisoners on board. After completing his tasks for Woozie, Carl is invited to visit him in his new location (The Four Dragons Casino in Las Venturas), as Woozie leaves San Fierro permanently. This page was last modified on 27 July 2012, at 14:55.